The U.S. Department of the Interior’s Bureau of Ocean Energy Management (BOEM) announced several actions over the past two weeks to advance the development of renewable energy resources on the Outer Continental Shelf (OCS). On June 3, BOEM issued a first-of-its-kind lease for marine hydrokinetic technology testing off the coast of Florida, which will allow the lessee, Florida Atlantic University’s Southeast National Marine Renewable Energy Center (SNMREC), to test turbines powered by ocean currents. Last week, BOEM published a Call for Information and Nominations to solicit nominations for companies interested in developing wind energy projects in a proposed lease area off the coast of Long Island, New York. In addition, BOEM announced the commencement of its environmental review process for a proposed floating wind turbine project off the Oregon coast. BOEM’s issuance of a lease to SNMREC will allow the lessee to install anchored floating test sites to evaluate turbines of multiple designs, all of which will be powered by the ocean currents of the Gulf Stream. The testing areas will be sited in waters 10-12 nautical miles off the coast of Fort Lauderdale, Florida. This lease marks a major step in SNMREC’s effort to test the commercial viability of hydrokinetic technology. That process formally began in August 2011, when SNMREC applied for a lease under BOEM’s interim lease policy. In April 2012, BOEM published an Environmental Assessment (EA) for the project and, in August 2013, BOEM published a revised EA and a Finding of No Significant Impact that paved the way for BOEM to ultimately grant the lease. SNMREC must now develop and submit a project plan for BOEM’s approval. The Call for Information and Nominations in the proposed Long Island wind leasing area was precipitated by an unsolicited lease request submitted in 2011 by the New York Power Authority (NYPA) on behalf of the Long Island-New York City Offshore Wind Collaborative (comprised of NYPA, the Long Island Power Authority, and the Consolidated Edison Company of New York). Following this request, BOEM issued a Request for Interest to gauge whether other parties were interested in developing an offshore wind facility in the area of the Outer Continental Shelf (OCS) identified in the NYPA lease request. BOEM received indications of interest from Fishermen’s Energy, LLC and Energy Management, Inc.
BOEM is required to award offshore renewable energy leases on a competitive basis unless it finds that no competitive interest exists. 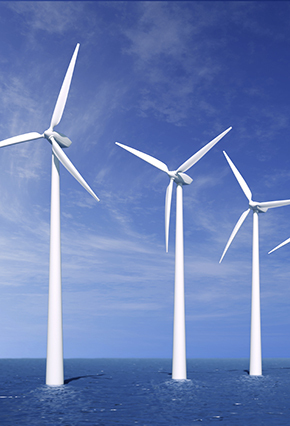 Therefore, on May 28, BOEM published a Call for Information and Nominations to solicit nominations for commercial wind energy leases in the area. BOEM also requested comment on a range of issues that could be relevant to the leasing process, including the existence of potential archeological resources, the potential effect of leasing on the human, marine, and coastal environment, and the potential for conflicts with other uses in the area (including a proposed liquefied natural gas facility and recreational and commercial fishing). Together with the Call for Information and Nominations, BOEM published a Notice of Intent to Prepare an Environmental Assessment to begin the scoping and stakeholder outreach process that the agency must undertake to comply with the National Environmental Policy Act (NEPA). Comments and nominations for the Long Island leasing area are due by July 14, 2014. After reviewing these submissions, BOEM will identify the areas for environmental review and consideration for leasing, prepare its EA, and then issue a Proposed Sale Notice (PSN) describing the areas proposed for leasing and any terms and conditions of the lease sale. If BOEM decides to move forward with lease issuance after considering any comments it receives in response to the PSN, it will issue a Final Sale Notice (FSN) announcing the lease sale and setting forth the areas available for leasing, the final lease terms and conditions, and the criteria to be used for lease award. As long as there is still competitive interest in the leasing area, BOEM will hold a competitive lease auction similar to those it has held for other offshore wind leasing areas off the coasts of Virginia and Rhode Island. BOEM’s announcement that it will begin the environmental scoping process for an EA of the impacts of issuing an offshore wind lease off the Oregon Coast is the next step in a process that began when Principle Power, Inc. submitted an unsolicited lease request in May 2013. Principle Power is proposing to construct a 30 megawatt floating wind project approximately 16 miles from shore off of Coos Bay, Oregon. On September 30, 2013, BOEM issued a Request for Interest in the proposed lease site. On February 6, 2014, BOEM determined that there was no competitive interest in the site, and announced that it would move forward with the leasing process for Principle Power without conducting a competitive lease auction. Through its May 29 Notice of Intent To Prepare an Environmental Assessment, BOEM will gather information on potential environmental impacts and alternatives. BOEM will also hold two public scoping meetings in Coos Bay to take comments from the public on the proper scope of the EA. After completing the EA, BOEM will either decide to study the environmental and other impacts more thoroughly in an Environmental Impact Statement (EIS) or it will issue a Finding of No Significant Impact and proceed to the next phase of the leasing process. Comments on the Notice of Intent are due July 28, 2014. BOEM’s announcement regarding the SNMREC hydrokinetic lease is significant because it expands the renewable energy portfolio of the federal OCS beyond wind to other technologies that could demonstrate commercial value. Although the SNMREC lease is intended for demonstration and testing of ocean current technology, the results of those tests will inform the direction of the hydrokinetic industry in the coming years. This project, combined with BOEM’s review of another application for a lease to evaluate wave energy converter performance by the National Northwest Marine Energy Center of Oregon State University, could ultimately provide a smoother path for permitting additional marine hydrokinetic projects on the OCS. BOEM’s announcement that it will begin taking comments on the scope of Environmental Assessments in the Long Island and Coos Bay leasing areas indicates that the agency is continuing to move forward with permitting new offshore wind farms in these two areas. The Coos Bay project, in particular, would be the first offshore wind project on the West Coast, and one of the first in the U.S. to use floating turbines. In addition, the Call for Nominations for the Long Island leasing area provides an opportunity for developers to indicate their interest in pursuing an offshore wind farm in a previously un-leased section of the Atlantic OCS. The comments that BOEM receives in response to these announcements will be important in shaping the parameters of its environmental analyses under NEPA and other statutes, and in determining what areas will be made available for leasing. Comments from stakeholders may also inform any limitations that BOEM decides to place on future leases in these areas. Because these environmental analyses have often been the subject of legal challenges to proposed offshore wind projects, it will be important for BOEM and any potential project developers in these areas to ensure that all relevant environmental, cultural, and historical needs and resources are properly evaluated and, where necessary, addressed through BOEM’s leasing process.